Julie Woloson has over 30 years of culinary experience in the Rochester and Finger Lakes areas. She’s enjoyed a wide variety of venues from bakeries and restaurants, was a chef/co-owner of Fiddlehead Concepts Catering for over 10 years, and currently owns and runs Café Sol Catering and Party House. Living in the Finger Lakes region, Julie has developed relationships with many nearby farmers and artisans, allowing her menus to focus on our local, fresh and seasonal ingredients. 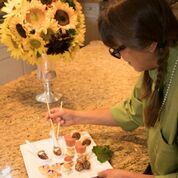 Julie enjoys the diversity of catering, delighting her clients with her culinary prowess, and her sense of style.